A JUNIOR MINISTER has taken to the Seanad floor to assure people that speed detection vans are about promoting safer driving, rather than being a money-making exercise. European Affairs Minister Dara Murphy was speaking on behalf of Justice Minister Frances Fitzgerald when he made the comments. 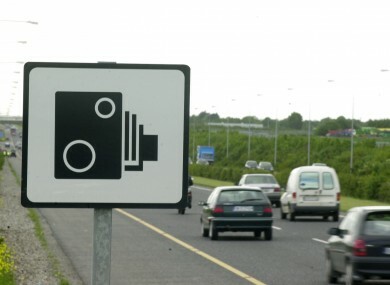 He was responding to independent Senator Fidelma Healy Eames who had asked why speed vans “are not located in dangerous driving black spots but appear to be placed instead in areas where speed limits increase, thus prioritising revenue collection over enabling positive driving behaviour”. Murphy said that ‘GoSafe’ cameras are located in “designated speed enforcement zones” selected by An Garda Síochána “following an extensive analysis of five years of collision data where speed was deemed the primary contributory factor in the incident”. Speed-detecting Garda vans are located in additional areas. Murphy assured the Senator that speed enforcement zones are “continually reviewed in light of survey data, collision history and local feedback”. He said monitoring is also carried out at set times and days based on when collisions occur. A higher weighting, and subsequently more monitoring hours, is assigned to those locations where compliance rates are lowest. When speed camera were introduced in November 2010 a total of 518 stretches of road were selected as speed enforcement zones. Since then additional zones have been identified as having a collision history suitable for inclusion, while others no longer merit inclusion based on “changes in driver behaviour”. The total number of zones currently stands at 727. Between January 2011 and October 2013, compliance in 50 kilometre per hour zones increased from 62% to 98%, with compliance in 80 kilometre zones increasing to 96% in the same period. “All of the analysis carried out points to the conclusion that the safety cameras have saved lives, and therefore bring enormous human and economic benefits,” Murphy said. The minster added that “slowing down would have prevented many of  fatalities” on Irish roads in 2014. Email “Minister: Speed vans aren't about making money, honest”. Feedback on “Minister: Speed vans aren't about making money, honest”.